I haven’t recommended any good new comics for a while. 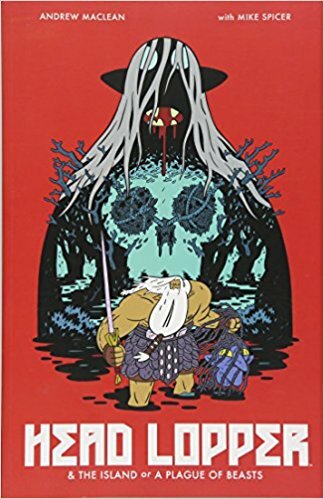 You should read Andrew MacLean’s Head Lopper. Its heart is in the right place. Everyone says it’s like Hellboy and they’re right. (Kind of a cross between Mike Mignola’s style and Guy Davis’, graphically.) But you could also say it’s Hellboy meets Adventure Time, with a bit of Samurai Jack on top. You can buy volume 1 on Amazon or Comixology pretty cheap [link]. It does that fast-paced, stylish, sword & sorcery with deadpan dialogue thing. Norgal, the barbarian hero, lops heads and (for reasons that remain obscure) hauls the lopped head of Agatha Blue Witch around. There are sea monsters and evil priests and foul beasts from the pit and giants and snakes and ghosts and cool maps and evil spirits trapped in bogs by goddesses and sinister stewards and queens and boy kings and giant wolves and bat creatures and amusing blacksmiths and etc. You’ll like it. John, I hope you indulge me posting a small tribute to Ditko (as I did to you and Kirby last year). The Amazing Spider-Man–I wonder if people realize that the “Amazing” in fact derived from his origin in Amazing Fantasy #15 (previous issues were called “Amazing Adult Fantasy”, amazingly! )–was a strong influence on me, and I always sensed that came from Ditko more than Lee. Peter Parker was a science geek, and I was one too, and I was not a jock, was teased quite a bit and bullied some (no more than most in those days), and Parker was a model of the frailty of ego even given great talent–he bitten by a radioactive spider, me bitten by the bug of wanting to know everything. I’m 65 and just retired after a really wonderful career as a philosophy professor, and yet, reflecting on Ditko’s death, I can still see how reading those comics molded my sense of what’s honorable, what’s just, what hope is. The poem below tries to capture that, riffing a bit on Uncle Ben’s famous line before he dies a death that Peter could have prevented, applying it to my life as I discovered the horror of racism in my family’s move from rural Tennessee to urban California at the age of 10. Of course the final lines are about how we need more Peter Parkers and fewer Donald Trumps. of an issue that hadn’t been sold. The rest is pristine. over my lifetime in one of my retirement accounts. whose kryptonite was his own soul, just, just like mine. grinning on boxes or dying in panels of a comic. in the face of power and responsibility.